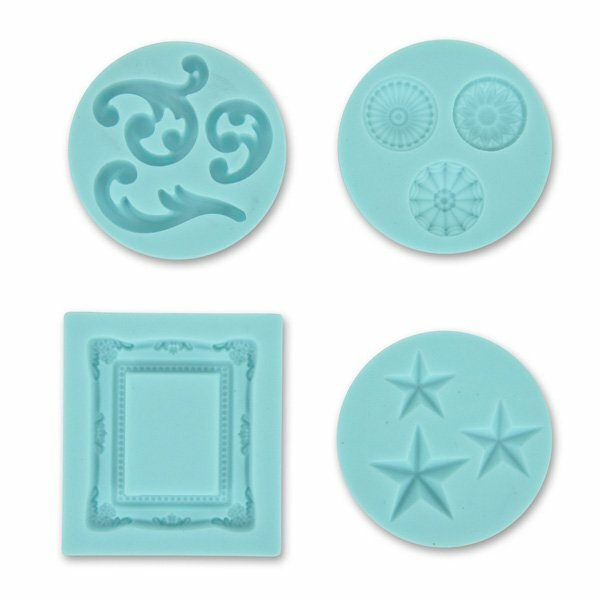 This Frames and Flourishes Silicon Mold kit by Martha Stewart contains 4 molds and creates dimensional scrolls, stars, icons, and borders for use as decorations, embellishments, and gift packaging. Use it with Crafter's Clay (sold separately) or another preferred clay. The flexible mold easily cleans with wet wipe or cotton swap and soap and water. Each of the 3 circular molds is approx. 5.6cm in diameter (outside dimensions). The rectangular frame mold is 5.7cm x 6.3cm (outside measurement) and produces a frame approx. 4.4cm x 5cm. Love this mould - results came out perfect and the details are amazing. The moulds are of a fantastic quality and easy to use. So glad i purchased and Nicola was so lovely too!